Purdue researchers are making mobile devices smarter and improving the efficiency of machine-learning technologies. One system allows devices to understand and immediately identify objects in a camera’s field of view, overlaying lines of text that describe items in the environment. Eugenio Culurciello, associate professor of biomedical engineering with appointments in electrical and computer engineering, mechanical engineering, and health and human sciences. “It analyzes the scene and puts tags on everything,” says Eugenio Culurciello, associate professor of biomedical engineering with appointments in electrical and computer engineering, mechanical engineering, and health and human sciences. The innovation could find applications in “augmented reality” technologies like Google Glass, facial recognition systems and autonomous cars. “When you give vision to machines, the sky’s the limit,” Culurciello says. Internet companies are using deep-learning software, which allows users to search the Web for pictures and video that have been tagged with keywords. Such tagging, however, is not possible for portable devices and home computers. “The deep-learning algorithms that can tag video and images require a lot of computation, so it hasn’t been possible to do this in mobile devices,” Culurciello says. 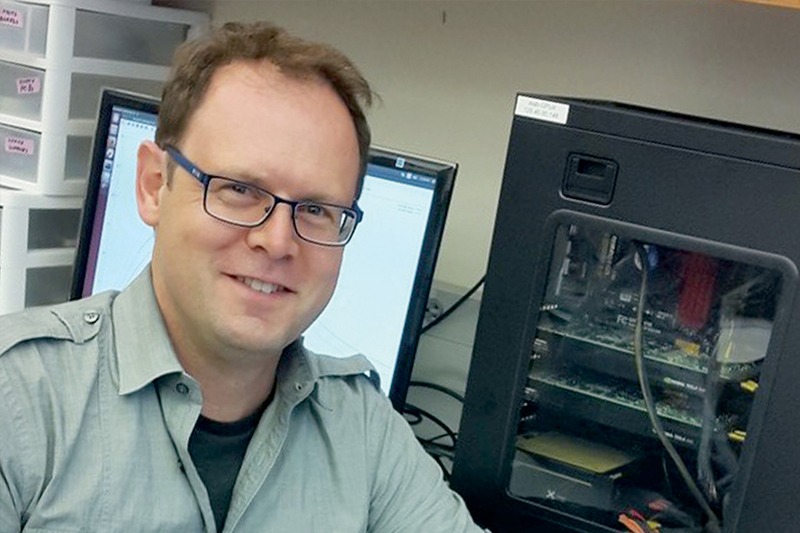 His research group has formed startup FWDNXT, based in the Purdue Research Park, that is designing next-generation hardware and software for deep learning. The team has developed a low-power mobile coprocessor called Snowflake for accelerating deep neural networks effective at image recognition and classification. Snowflake was designed with the primary goal of optimizing computational efficiency by processing multiple streams of information to mix deep learning and artificial intelligence techniques with augmented reality applications. In some cases, he says, it’s better than Nvidia’s GPU, the standard hardware used for research and development in deep learning and machine learning. While other research groups have focused on developing more accurate algorithms, Culurciello’s group has concentrated instead on efficiency. “Accuracy is not really the important metric by itself,” he explains. “What we try to do is maximize accuracy per watt or per operation.” While accuracy is important, efficiency is critical for applications like autonomous cars. “What good is accuracy if you have to wait 10 seconds for your autonomous car to decide how to act on a critical decision?” he says. FWDNXT, based in the Purdue Research Park, has developed a low-power mobile coprocessor called Snowflake that is effective at image recognition and classification. Snowflake uses innovative algorithms to differentiate items the same way humans do. 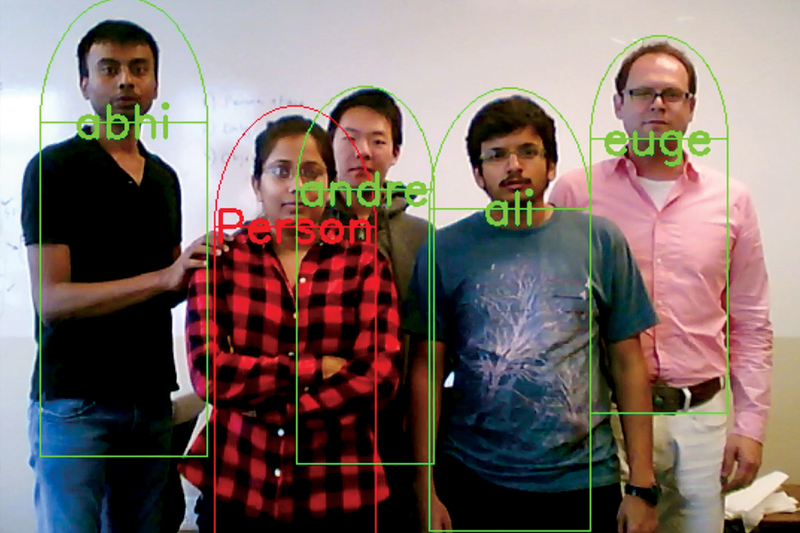 This screenshot shows how Snowflake is able to recognize and identify individuals. The goal of FWDNXT is to enable computers to understand the environment so computers, phones, tablets, wearables and robots can be helpful in daily activities. Snowflake is able to achieve a computational efficiency of more than 91 percent for an entire convolutional neural network, the deep-learning model of choice for performing object detection, classification, semantic segmentation and natural language-processing tasks. Snowflake also is able to achieve 99 percent efficiency while processing some individual layers, he says. FWDNXT’s innovation in hardware and software will be used to drive cars autonomously; to recognize faces for security and for numerous other day-to-day purposes; such as helping people find items on their shopping lists as they walk down a store aisle or helping smart appliances recognize a user’s preferences. The FWDNXT team includes graduate students Ali Zaidy, the lead architect, designer of Snowflake and a deep-learning expert; Abhishek Chaurasia, the team’s deep-learning lead developer; Andre Chang, architect and compiler of deep-learning; and Marko Vitez, neural network optimization wizard. 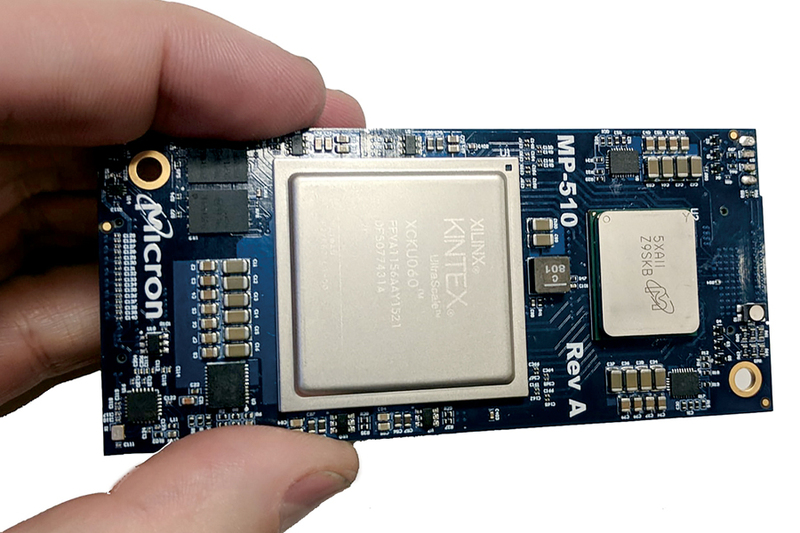 This is a Field Programmable Gate Array module from Micron, where FWDNXT installs Snowflake, a deep neural network accelerator. Snowflake was designed with the primary goal of optimizing computational efficiency by processing multiple streams of information to mix deep learning and artificial intelligence techniques with augmented reality applications.